The Invergordon Archive - The Clark's "on the end"
The Clark's "on the end"
This picture was taken in 1984 when my sister was on a trip "home" from Canada. 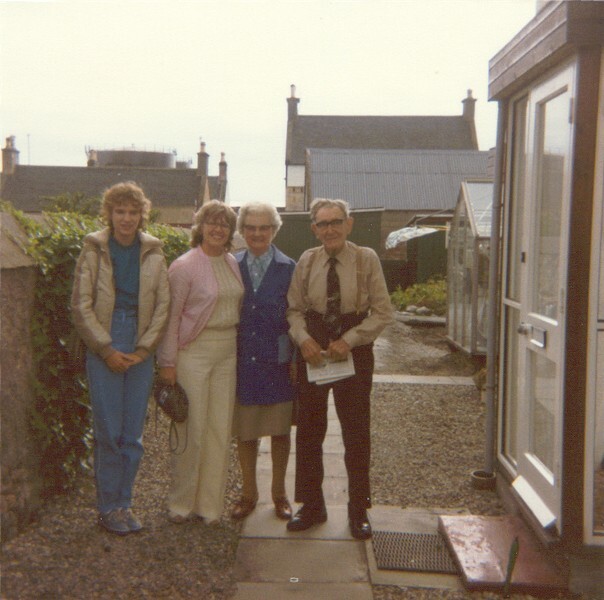 Left to right is my sister's daughter Heather, my sister Margaret, Mrs Clark and Mr Clark, of what was then known as 6 Outram St. They were known as the Clark's "on the end" as they lived on the end of the row of houses and there was another Clark (Buckie) that lived at number 5. They are the parents of Catherine Mackenzie (Clark) who is a frequent visitor to this site and I am sure she will comment on it. Mr Clark worked at the air-base at Evanton and he rode a motorbike to and from work. I am hoping Catherine can say what exactly he did...and will correct me if I am wrong. As you can see Mr Clark kept a very tidy yard, it was the talk of the block, everything was in its place..they were very good neighbours. Thank you for the picture Harry. Yes, my father worked at Evanton. He was an admiralty policeman there. He went back and fore to work on his motor bike in all kinds weather. He loved to work in the garden and even painted the stones round the borders! He died in 1987 aged 89 and my Mother died in 1995 aged 91. They were great and loved to welcome visitors. They were delighted when Margaret & Heather visited them. Your cousin Marion also visited them, Harry. Hi, Rosalie, you are very busy on the site! I sometimes see Janette. Where is Kay now? Harry, it's great to see a photo of Margaret and her daughter, and of course the Clark's. I remember Margaret singing - what a beautiful voice she had, probably still does. Catherine, I am so thrilled about this site that I'm forever on the computer. Kay lives in Bradford. She trained as a teacher as did I but she went on to write children's poetry books with her husband. He is responsible for "poetry on the underground " in London. I always look forward to coming home to Invergordon and staying with Janette and Hec. Hi Catherine, I now live in your old house with my 2 children. Have done for just over 10 years now. Loved the house from the minute I stepped foot in it. I try to keep the garden in good order, it's full of toys now. There's still some plants that were there when we moved in, thriving well. I have a little cane plate up on my kitchen wall which was in the shed - it reads "FRIENDSHIP Glad Days Sad Days Are All Brighter Made With the Happy Knowledge that Our Friendship Will Not Fade"........I couldn't bear to throw it away and often wonder who sent it to who? There's still some old calendars up in the shed too, dating back to the 60s and 70s. Hi Janet, not sure about where the plate came from but I remember it. My father used to put a calendar up in the shed every year and if he liked the previous year it stayed up as well! He had a few ornaments as well but I took them before Leslie moved. I was born in the house and it holds many happy memories for me.